Mount Pulag (or sometimes Mount Pulog) is the third highest mountain in the Philippines. It is Luzon’s highest peak at 2,922 meters above sea level. The borders between the provinces of Benguet, Ifugao, and Nueva Vizcaya meet at the mountain's peak. Because of its high elevation, the climate on Mount Pulag is temperate with rains predominating the whole year. Rainfall on the mountain averages 4,489 mm yearly with August being the wettest month with an average rainfall of 1,135 mm. Snow has not fallen on its top in at least the past 100 years. The mountain hosts 528 documented plant species. 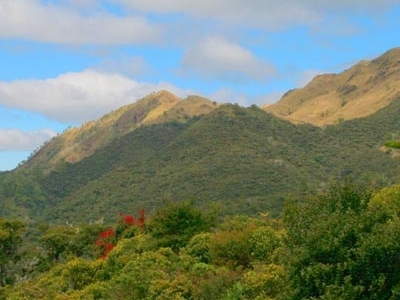 It is the natural habitat of the endemic Dwarf Bamboo, (Yushania niitakayamensis) and the Benguet pine (Pinus insularis) which dominates the areas of Luzon tropical pine forests found on the mountainside. Among its native wildlife are 33 bird species and several threatened mammals such as the Philippine Deer, Giant Bushy-Tailed Cloud Rat (“bowet”) and the Long-Haired Fruit Bat. Mount Pulag is the only place that hosts the 4 Cloud Rat species. It has one of the most diverse biodiversity of the Philippines, with the newly found (since 1896) 185 grams Dwarf cloud rat, Carpomys melanurus, a rare breed (endemic to the Cordillera) and the Koch pitta bird among its endangered denizens. On February 20, 1987, a large part of the mountain was designated as a National Park with Proclamation No. 75. This act aims to preserve the environment around the mountain due to threats from increased development such as conversion to agricultural lands, timber production, hunting, and increased tourism. The Ibaloi people of Benguet mummify their dead and house in caverns in the mountain. The Kabayan mummy burial caves, one of the main attraction of the site, is considered as Philippine National cultural treasures under Presidential Decree No. 374. As the highest mountain in Luzon, Mount Pulag attracts a lot of mountain climbers. Highlights of the climb include the montane forests and the grassland summit with its "sea of clouds" phenomenon. There are four major trails up the summit: the Ambangeg, Akiki, and Tawangan trails from Benguet and the Ambaguio trail from Nueva Vizcaya. These trails are managed by the Mount Pulag National Park, under the Department of Environment and Natural Resources. Here's the our members favorite photos of "Peaks or Summits in Luzon". Upload your photo of Mount Pulag! Get in touch with 6 Touristlink members who want to visit Mount Pulag or with Tom Lohmcolm, Ruben Jr. and 6 others who already have been here.